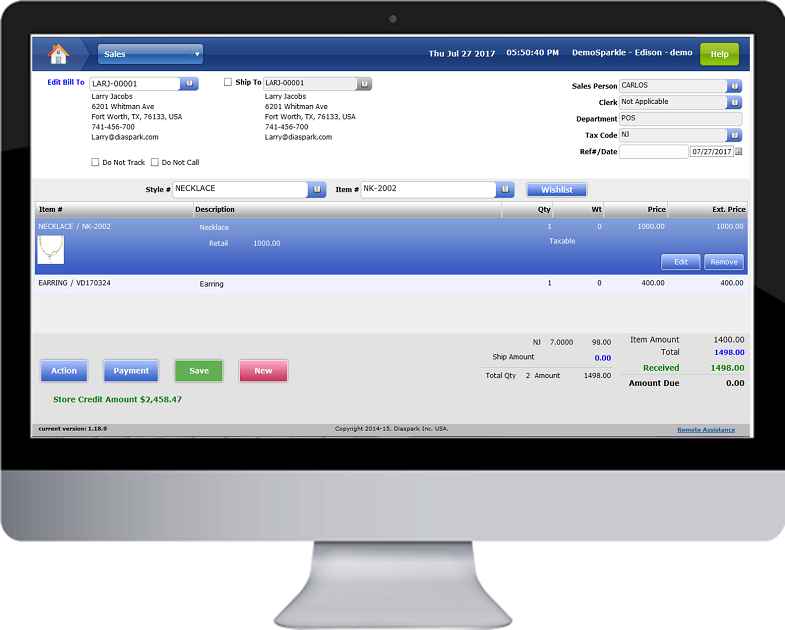 Powerful and intuitive point of sale features to efficiently focus on increasing sales volume and aiding your customers. Diaspark Retail consists of point of sale automation features, management capabilities and analytics to smoothly run your jewelry retail and wholesale businesses. Completely track sales process in one screen. Search for sales for any time, generate invoices with or without customer information, customer refunds and charge accounts with separate billing and shipping addresses. Take partial payments from the customer against purchase of jewelry items and finalize the sale after receipt of full payment for the order. Generate notes, enter transaction and record customer’s special order information and take customer deposit for each transaction. Bill the item to the customer after the order is ready. Determine the value of jewelry items, easily create appraisal documents and generate letter of value to customers by setting standard charges. Record all necessary information for jewelry & watch repair including images and issue necessary items and services at the same time. Manage jewelry returns and exchange, make full refunds, issue store credit and exchange a jewelry item for another. Allow retailers to access all data they need on their stores, sales, products and customers with an intuitive interface. End of day reconciliation for various analyses: Receipt report, Sales report and Z out report. The software can generate gift certificates, track and redeem the use of gift vouchers, cards, certificates issued.